EDINBURG, Texas (CNS) — Throughout his life, in times of triumph and happiness and in times of suffering, pain and fear, decorated war hero Francisco Barrientes has given witness to his faith. After graduating from Edinburg High School, Barrientes was drafted into the U.S. Army in 1968 and deployed to Vietnam. “When I first arrived in Vietnam, I saw all these people dying, I saw killings,” said Barrientes, who celebrated his 69th birthday Dec. 5. Barrientes, who was an altar server throughout his childhood and teenage years, also assisted the chaplains who trudged out into the jungle to celebrate Mass for the soldiers. “I have always said that my faith really helped me,” he said. Barrientes was injured May 5, 1969, when an enemy hand grenade struck his leg. He spent two weeks in the hospital before he was sent back to the jungle. A few weeks later, on June 20, 1969, he sustained a gunshot wound to the face, which left him fighting for his life. “When I got shot, I remember going blank, but during that time I was able to see all my family gathered around a river, a stream with water so clear that you could see all the way to the bottom,” Barrientes recalled. “There were birds, all kinds of birds singing. … And then all of a sudden I remember jumping up again and then going to the landing zone where we went to get some help. The injuries he sustained changed his life forever. He was in and out of the hospital for more than seven years and has undergone more than 40 surgeries since he was injured. Barrientes was given a medical leave of absence June 1, 1971, and began volunteering at Holy Family Church in Edinburg. Barrientes volunteered as a groundskeeper for decades before a maintenance man was hired. He also volunteers as a sacristan, an usher, helps with religious education and wherever else he is needed. He assists the priests at most funerals since most of the altar servers are in school during the day. On most Sundays, he is at the parish church from 8 a.m. to 3 p.m. to help out at all the Masses and to open and close the buildings. In 1981, he also began volunteering at Lyndon B. Johnson Elementary in Edinburg where his children attended school. He also volunteered with several civic organizations. In 2002, he was named a Hero for Children by the Texas State Board of Education for providing outstanding service and dedication to public schools and students. Only one person per region is selected. In 2006, the Edinburg school district named a middle school in Barrientes’ honor, which recently celebrated its 10-year anniversary. Barrientes also volunteers there two to four hours a day and is a familiar face at sporting events and other school activities. 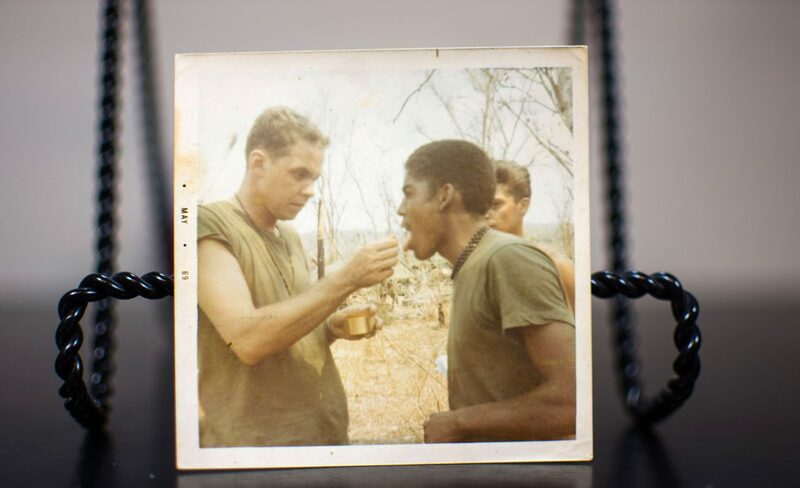 He also regularly visits other schools, often in uniform, to talk with students about his experience as a soldier in Vietnam and to encourage them to study hard. Barrientes and his wife, Martha, have been married for more than 44 years and have three children and a granddaughter. Ybarra is assistant editor at The Valley Catholic, newspaper of the Diocese of Brownsville.